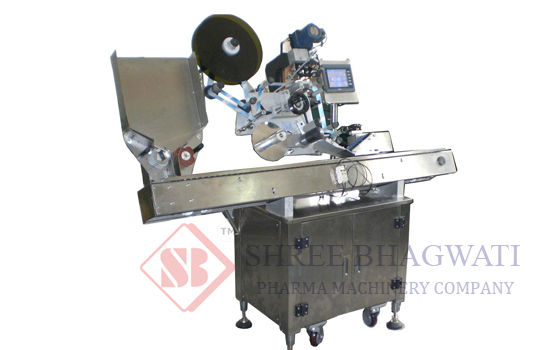 The vial sticker labeling machine is completely automatic and can be operated at extremely high speeds. Moreover this SBSL–300 model is very user friendly, and also has several other outstanding features. In fact, it is built using the most modern micro processor controlled label dispensing system. The vial labeling machine also includes the latest sensing system for labels, and many other products. It is therefore regarded as the ideal machine for labeling round vials, small sized bottles, and several other round objects; which are made from glass, plastic, PET, HDPE, PP, etc. This swift and sturdy equipment has the ability to label at the most 300 units in a single minute; based on the diameter of the product and size of the label. Further, the roller spacing device of this totally automatic vial sticker labeling machine, results in a simple no parts change system. In addition to this, it also helps you to do away with the star wheel or feed worm for evenly separating the products. Besides this SBSL–300 vial labeler machine even incorporates an exceptional, single point synchronized speed control system. Moreover, it also has a programmed label length detecting system. This built-in mechanism thus helps to avoid the manual feeding and storing of the label length data into the memory; and again retrieving that information every time, when you want to change the label size and restart the vial labelling machine. As a result this automated system helps to save your time by preventing machine downtime, and also increases the efficiency. These vial labeling machines are even available with an optional tough glass, or acrylic safety cabinet. This advanced vial labelling equipment actually includes all the basic features that are required in a standard machine, to meet the diverse needs of the customers in the local and global market. Speed Up to 300 Labels per minute depending on Product and Label Size. The speed is also depending on stable movement of product on machine conveyor at higher speed. Option of Contact Coder, Hot Foil Coder, HP Cartridge Coder and Inkjet Coder with various speed ranges available. Colour or Mono Touch Screen with PLC for machine operation and showing various error messages and information on display.